The Caipirinha’s simple combination of cachaça, lime, and sugar opens a myriad of opportunities for other seasonal fruits to join the party. In Brazil, Caipirinhas with muddled fruit are called Caipifrutas and some of the most popular include passionfruit (maracujá), strawberry (morango), and pineapple (abacaxi). Inspired by the Caipifruta, we sought to create a similar formula for a variety of easily executed, delicious, and seasonal Caipirinhas. We discovered that a fruit liqueur paired with a few fresh berries added a new dimension to the classic Caipirinha without making it excessively complicated to understand or labor-intensive to produce. Good quality fruit liqueurs pack a lot of flavor in a small dose, and are often the best means to add flavors from fruits like pears, peaches, and even bananas, since muddling these in a drink would create a pulpy mess. Berries are a generally more muddleable type of fruit because their high juice content adds loads of color and flavor. Berries have a good juice-to-pulp ratio for Caipirinhas. 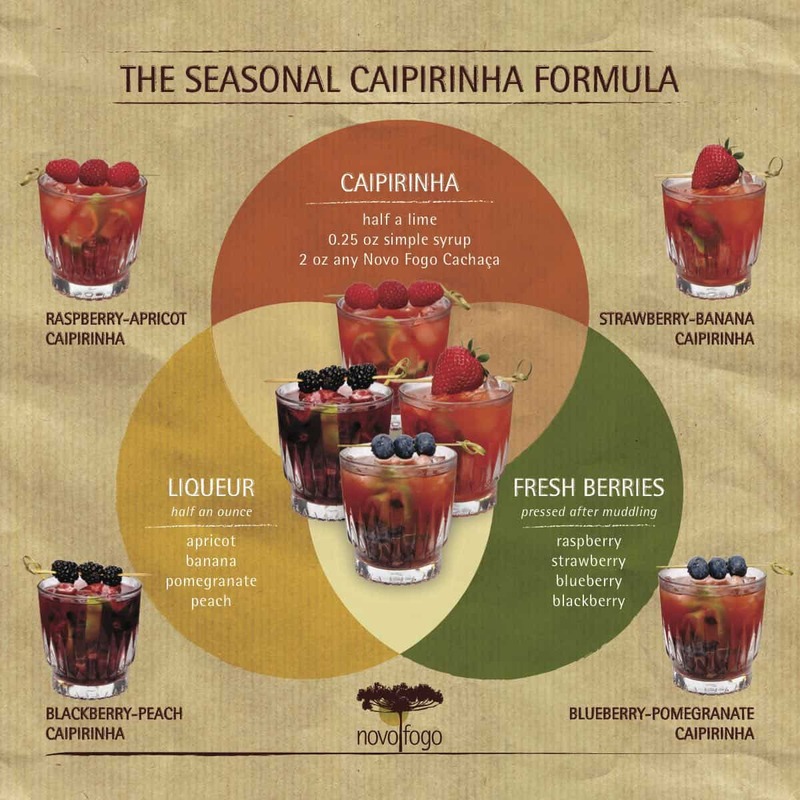 An important consideration behind the liqueur+berry Caipirinha formula comes from a desire to make a complex-tasting drink approachable to a lot of people. Jim Romdall, our West Coast sales ambassador and longtime bar manager in Seattle, offers this advice: “For most guests to understand and order a drink on a cocktail menu, it can only have one unfamiliar ingredient.” So if cachaça is an unfamiliar spirit for people (say it with us: ka-sha-sah), it’s possible to create accessible cachaça cocktails by surrounding the base spirit with broadly-identifiable flavors. Moreover, this particular liqueur+berry Caipirinha formula is easy to prepare: First, muddle half a lime to extract its juice. Toss in a few fresh berries and give them a quick press. Instead of sugar, add about a quarter-ounce of simple syrup, along with about a half-ounce of fruit liqueur and 2 ounces of any Novo Fogo Cachaça. (Note: the specific amounts of simple syrup and liqueur will depend on the berry and liqueur, which can vary in sweetness.) At this point, you’ll have a bunch of liquid and some floating fruit bits in your glass, so a quick stir will mix everything together. Simply fill the glass with ice and give it another stir, garnish with some berries, and voilà!